The service for Lochee churches was held this year in St Clement’s RC Church, Charleston. Despite the horrendous weather of snow and wind, on the day and for the previous three days, Fr Johney Raphael, the Parish Priest, who is from Kerela, India welcomed the congregation of 22 people from various local churches. 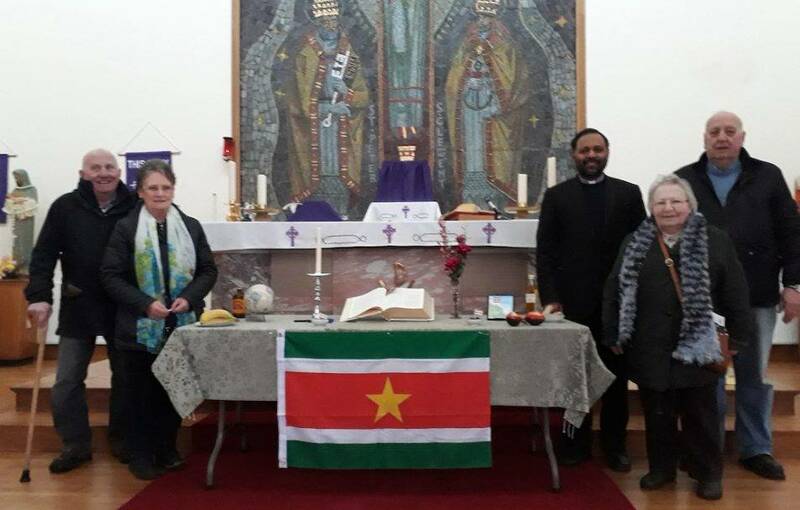 The service, written by the women of Suriname, theme was “All God’s creation is very good!” The three leaders were from St Clement’s Church and the other seven readers, representing women of Suriname, were from other churches in Lochee. There was a table at the front of the altar with a green cover and displayed on it were the Bible, a globe and map showing the location of Suriname, flowers, Surinamese CD’s and musical instruments, crude oil, olives, berries, rice and plantain, hanging at the front of the table was the Suriname flag. Aileen Swan welcomed the people and gave them a small card with a sea turtle on it and asked them to write a personal commitment to care for God’s creation. During the service Fr Johney read out a few commitments. Before the service we played some Suriname music and Ninian, the organist, accompanied us with the hymns and played music during the offertory. Everyone enjoyed the service, which was lead by Bernadette Dailly, who thanked everyone for coming along, then we had refreshments, which included some products relating to Suriname – Gingerbeer, Fiadu Cake (fruit), Lumpia (spring roll), & Somosa. These were enjoyed in the church porch due to the weather.